Vintage eight foot Chesterfield sofa from England, circa 1960s. The fabric is a very soft pleather/vinyl. It sit beautifully which is unusual for chesterfields which sometimes can be uncomfortable. Stunning round yew wood dining table that is marked made in England. Fabulous condition, no leaves, sits up to 10 depending on chairs. 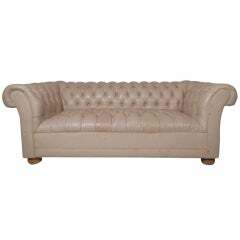 A handsome Chesterfield sofa completely tufted. Nice age and wear to the leather. Very deep and comfortable seating. French dark brown Chesterfield sofa with original leather with Nailhead detailing along the Arm rail and base. 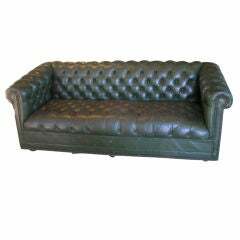 Beautiful green leather tufted sofa. 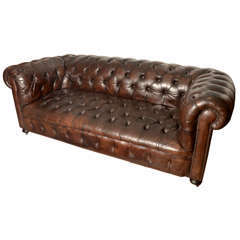 Has a gorgeous patina, nailhead details and is very comfy. The front has casters and the back has legs.